At Ward’s Supermarket, we appreciate customer feedback! We love to hear your store and product experiences, your product ideas, or just your story. If you’d like to place a special order, please call us at (352) 372-1741. For all other concerns, call (352) 372-1741 or fill out the simple form below. Trying to find Ward’s Supermarket? 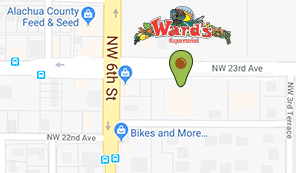 You can see us on the map here or find us at 515 NW 23rd Ave, Gainesville, FL 32609.